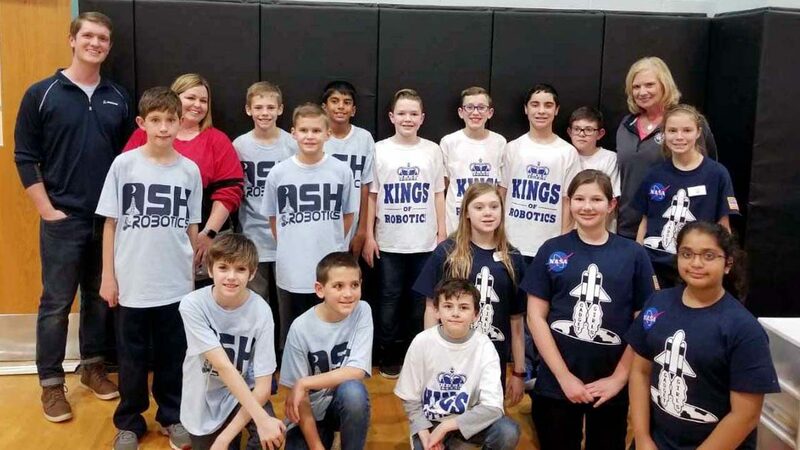 Congratulations to the Academy’s three robotics teams, consisting of Fifth, Sixth, and Seventh class students, that competed in the First Lego League Tournament last Saturday! Our teams competed against 21 other teams from the St. Louis region. During the tournament, teams gave presentations to a panel of judges on a project related to living in space for an extended amount of time. They also explained their design of an autonomous robot, displayed core values (teamwork) and performed robot challenges on the game board. Two of our teams, the Gadget Girls and Kings of Robotics, earned awards for their research projects. Our third team, ASH Robotics, scored well in all areas of the competition. We are very proud to say that our teams swept the project category at the robotics tournament! Out of 24 teams in two divisions, Academy teams won the project category in both divisions. In order to win in this category, they had to choose a real-life problem related to living in space, create a solution, research the solution, share it with professionals and present their ideas to judges! Très bien!